Be Safe & Enjoy the Celebrations!!! The annual Caribbean street party known as J’Ouvert begins in the pre-dawn hours Monday in Brooklyn, a festive prelude to the West Indian Day Parade. The J’Ouvert mini-parade starts at Grand Army Plaza and proceeds down Flatbush Avenue and east on Empire Boulevard to Nostrand Avenue. 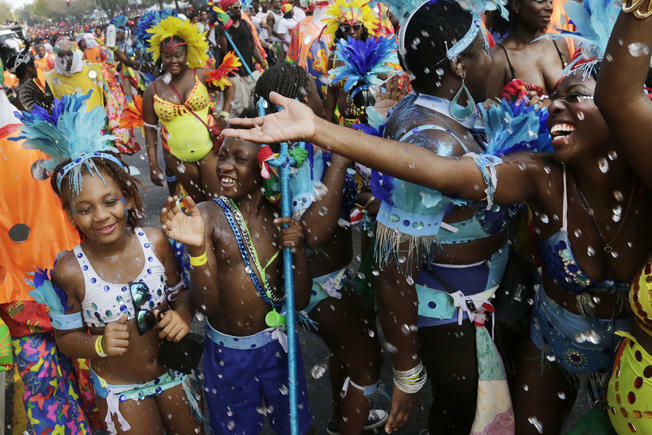 Hundreds of thousands are expected to participate in the celebration of Caribbean culture. Three grand marshals will lead this year’s West Indian Day Parade: Maxine Williams, Global Director of Diversity at Facebook; U.S. Virgin Islands Gov. Kenneth Mapp, who was born in Brooklyn; and Earl Phillips, secretary treasurer of the Transport Workers Union, Local 100. The parade is scheduled to begin at 11 a.m. at Eastern Parkway and Schenectady Avenue and will end at around 6 p.m. on Grand Army Plaza in Prospect Park. Eastern Parkway will be closed between Howard Avenue and Grand Army Plaza during the parade. Previous PostWords Matter: History and Rebellion at the SmithsonianNext PostFrom Within and Without: The History of Haitian Photography.